The railways to the south of London into Sussex and Kent are, like many other routes, under capacity pressure. Finding space for the projected growth in passengers is becoming very difficult, especially as trains start to reach the maximum practical length of 12 cars. This blog looks at one possible solution for Sussex and West Kent. The Sussex and Kent lines are some of the more complicated services out of London. The long distance Sussex services run from both Victoria and London Bridge, through East Croydon and Gatwick Airport, with routes to Horsham and Lewes off the mainline to Brighton. There are four tracks from East Croydon to just south of Three Bridges, after the Horsham route separates. The two track mainline continues through to Brighton, an area which is under capacity pressure. More pressure occurs through East Croydon, where there are only four tracks to serve the whole of Sussex, including some suburban services. Solving the Easy Croydon problem is key to the Sussex area. The Kent services are complex due to their history of two competing companies. Services run from Victoria to the north and east of the county and Charing Cross to the west. As this is primarily a Sussex plan, the route from Charing Cross to Tonbridge and Hastings or Ashford is the one to discuss. It has four tracks through London to Orpington, dropping down to two tracks from there on. With just two tracks, it has some real limitations on the service that can be provided. In addition, there is a two track section between London Bridge and Charing Cross which provides an extra limitation, as it is shared with other routes to Dartford. Current plans involve an upgrade at East Croydon. This will potentially add two platforms to the station, and more tracks with a flyover to the north. Such an upgrade will ease the immediate pressure and allow the main line to be used to its maximum, but the capacity pressures are greater than this. The Network Rail route study is also available. A proposal from outside Network Rail, the BML2, involves reopening the line from Lewes to Uckfield to provide a second route from Brighton to London. However, this would result in more trains through East Croydon, not less. As such, the plan's authors propose using an old rail link to Elmers End, displacing the popular tram. They would then run on the existing railway line to Lewisham, currently discussed as a Bakerloo line extension. While this plan has some merits (the route from Lewes to Uckfield should indeed be reopened), the London part of the plan is in the author's opinion completely unreasonable. Finally, it is important to emphasise that the UK's second busiest airport, Gatwick, is located directly on the main line. This provides significant traffic, but is also a problem to capacity. In recent years, it has proved difficult to maintain the dedicated 4tph (trains per hour) airport express, resulting in a significant service degradation to the airport. To provide a second runway at Gatwick, and handle the significant growth that entails, will need more investment. When looking at the area in its entirety, it is clear that at some point a radical solution will be necessary. The Sussex Relief Line is a proposed approach to providing the step-change in capacity needed for the area. This is a high level proposal, so readers should not consider any lines on the map as being accurate. The goal is to produce a scheme with widespread benefits to boost the business case. The core of the Sussex Relief Line is the provision of a new main line for the area. This is needed to cope with capacity in the future, especially if Gatwick is to expand. Since London is so heavily built up, any sensible proposal is going to involve significant tunnelling. The interesting part of this proposal is the proposal routing. Once a new line and significant tunnel are accepted, there is no need for such a line to be routed close to the existing line. Rather than go via East Croydon, which would still be well served, the new line could run via a different outer London centre. Bromley is the obvious candidate here, especially as it is very poorly served at the moment. And while tunnelling is fairly expensive at around £100m per km, it tends to produce reliable services (less weather issues for example). This diagram shows the route more clearly, together with the major connections, Crossrail and the Jubilee line. 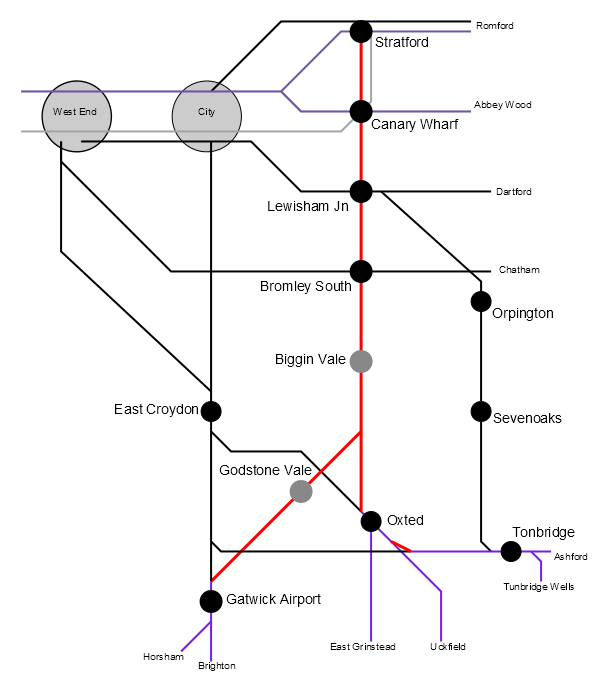 The red line is the new relief line, and the light purple are existing lines that could be served from the new line. 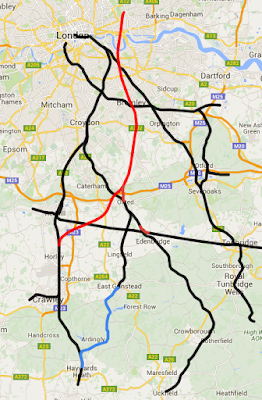 Not shown on the diagram is the potential to link East Grinstead to Haywards Heath, or to link Uckfield to Lewes. The London section is particularly key to the benefits of the scheme. Bromley to Canary Wharf is currently 45 to 55 minutes. With this scheme, that would drop to just 10 minutes. Lewisham to Canary Wharf would drop from 15 minutes to 4 minutes. And as both stations would be junctions, it would be easy for passengers at other stations in south east London to change and benefit from similar journey time reductions. Gatwick access is similarly improved. For example, passengers from places such as Chatham and Canterbury would simply change at Bromley South rather than be forced to change at Victoria as they do now. By reaching Stratford in the north, passengers from Sussex and West Kent would have a much faster cross-region journey. Trips to Norwich, Colchester, Cambridge and Stansted would no longer involve travel via central London. For example, Brighton to Colchester would see journey times drop from more than 2 hours 40 to less than 2 hours. If the Anglia Relief Line were also built, then the effect would be even more transformative. While the transport benefits of this proposal are large and beneficial, it is also necessary to consider the development potential that the new line could generate. Such development would no doubt be unpopular, but we are in a housing crisis and new options should be considered. The two locations on the map marked with grey stations - "Biggin Vale" and "Godstone Vale" are possible locations for housing development in new towns. The "Biggin Vale" potential development site is likely to be in the valley west of Biggin Hill, although the airport itself might be considered an alternative development site. The "Godstone Value" potential development site is likely to consist of much of the land between Godstone and Oxted, with a focus on the existing golf courses. Since the whole area is green belt, no development can occur without Government decision makers choosing to permit the green belt protection to be selectively removed. However, were development to occur, the sites would be about 15 and 20 minutes from Canary Wharf, making them highly desirable. Were the Biggin Vale site to be developed, it would make sense to extend the tram from New Addington to the new station. This would provide connections to the major centre of Croydon, and also provide a big boost to New Addington itself, potentially including regeneration. In addition, such a new line would permit greater development to occur at existing towns, including Lingfield, East Grinstead, Edenbridge, Crowborough, Tonbridge and Three Bridges, with all these places likely to be within 45 minutes of Canary Wharf. Since all services would stop at Bromley South and Lewisham Junction, those stations would have a truly excellent service. This proposal outlines a conceptual new line for Sussex and West Kent. It tunnels through London from Stratford to Bromley before serving potential development sites on the way to Gatwick. Connections would allow services to run to Oxted, East Grinstead, Uckfield and Tonbridge. At the north end, it has the potential to link on to the Anglia Relief Line, providing fast cross-region services. If you think the concept proposal has merit, or have any other opinions, why not leave a comment! Hi Steven - your proposal obviously draws some inspiration from BML2; would you mind detailing where it differs (such as in Croydon) and what the advantages of doing so are? It is my opinion, and that of others, that using the Elmers End to Lewisham route for BML2 is simply not viable. The route has a local service that cannot be displaced, and is being built next to at Catford, preventing 4 tracking. The broad concept of a Thameslink-style route via Canary Wharf however is reasonable. In essence, this blog outlines what such a route would look like. If the Sussex Relief Line were built, then reopening Lewes to Uckfield would be much more of an obvious thing to do. On Croydon, there is no need to send a new line via it. Once looking at a new line, it is much better to look at new potential destinations, Bromley in this case. Such a new routing widens journey opportunities, and crucially, widens the scheme benefits (to offset against the cost). BCR matters. Some interesting suggestions and in many ways makes more sense than BML2, however the additional challenge (and cost) is from the underground stations. I'm also not sure Canary Wharf (or even Stratford) is that important a destination outside peak hours, apart from people commuting to CW who else would want to use such a service? I agree that whether Canary Wharf is the best destination is a real question. However, space in central London is getting more tricky, and with the general increase in demand, more and more people will want access to East London generally. Where it would work best is with the through services to Stansted and good connections to Kent and East Anglia. Stratford itself is a key shopping destination, so would be popular enough off peak. No doubt that the BCR for this scheme is tricky as currently measured however. Great proposal Stephen, particularly if linked to your suggested Anglian Relief Line proposal, giving a direct link between Gatwick and Stansted. Perhaps this could also complement the latest HS4Air proposal to link HS1 with HS2 via Gatwick and Heathrow, thus further creating the envisioned "M25 railway". What are your thoughts on extending your proposal down to the coast to Brighton with additional East and West Coastway links too? The Brighton Main Line is fairly constrained along it's entire length and with just the two track section south of Three Bridges handling most of the traffic from the Sussex coast, this will become a barrier to any future growth on the route. This is purely suggestive ofcourse but how about new tracks south of Gatwick running alongside the M23/A23 down to Pyecombe with new stations at Hickstead and Hurstpierpoint and then extensive tunnelling south of there into subsurface platforms at Brighton? A new West Coastway link could be Hurstpierpoint to Worthing via Steyning, again with extensive tunnelling through the South Downs, joining the West Coastway between Lancing and East Worthing. A new East Coastway link could be Hickstead to Lewes via Ditchling, skirting the northern edge of the South Downs and joining the Keymer-Lewes line south of Cooksbridge. All this additional capacity, effectively creating a proper "BML2" could potentially make Gatwick a major rail hub with direct high speed connections to Canary Wharf, Stratford, Stansted, GEML, Heathrow, GWML, HS2 and CTRL. Obviously cheaper and far less intrusive options could be to make more use of the Arun Valley Line for additional West Coastway traffic, plus a Lewes-Uckfield rebuild, with selected redoubling and "wiring up" of the existing Uckfield route for additional East Coastway traffic. Not too sure about the East Grinstead-Haywards Heath connection though unless you're suggesting some sort of joint operation between the Bluebell and national rail. At some point there will need to be 4 tracks south of Gatwick, but without the section north of there there is no point in the investment. I suspect that enough of the line could be four-tracked on the existing alignment south of Gatwick without needing a new alignment. This is why the best thing is to focus on the London section first.